Detoxing is not just about the food that you put into your body, it’s also about what you read, watch, listen to, and in this case, what you put on your body. It can be overwhelming and disempowering to understand the hundreds of environmental contaminants we carry in our bodies. Even in tiny amounts, they have a potentially negative impact, depending on your individual body's ability to tolerate and eliminate them. But then there is the cocktail effect as they mix in our bodies in completely unknown and unpredictable ways. Governments set limits on known toxic compounds, but are lobbied by powerful chemical companies to give them as much commercial freedom as possible. But the cocktail effect of all of the individual chemicals combined in the may different products we use is seemingly no one's responsibility. And anyway, it would take excessive funds from the industries involved to test for the effects of such combinations as they are so complicated. So, despite being cited as one of the biggest chemical issues of our time, it remains unchecked. And the body's safest storage place for most of these un-time-tested chemicals is in fat cells. Rather than getting weighed down and wallowing in the pointlessness of it all, better do what we can. And we can do a lot ! Firstly, as said many times: the greatest power we have is simply not to buy into it. Detox your body - you know we believe in that... That's why we have been running detox retreats for 20 years. Eat organic - limit the poisons coming in from food... It may be more expensive, but there is no sounder investment. Eat like your digestive system was evolved to eat. Don't be fooled by our big brain and clever tech. We have the gut of an ape - eat like it ! Combine foods properly - to aid digestion rather than fermentation - separating dense foods from each other (protein/starch/sugar) with lots of salad. Detox your home - All new furnishings carry poisonous butanes as flame retardants, as well as vanishes, paints, etc. Get natural ones, or second hand ones. Even new clothes are busy gassing off their chemical dyes, and you don't need to dig deep to hear the atrocities of the fashion industry. If you wouldn’t put it in your body, don’t put in on your body. Cosmetics, shampoos, deodorants, sunscreens, and body lotions are laced with heavy metals and other toxic ingredients. They get absorbed into the body through your highly porous skin. Pour into jar and leave to cool and set – this will take quite a while – I usually pop mine outside. It will set to a cream coloured soft solid. You may need to adjust the consistency, as how hard it sets depends on the ambient temperature. Bring it inside and leave in your bathroom for a few hours to see how hard it’s going to remain. In colder temperatures the cream will be solid. This still works, simply scrape some out and it will start melting as you apply it to the skin. If it sets completely hard and you would like a softer consistency, re-melt and add another teaspoon of almond oil and set again. Coconut oil is the ideal shaving oil! Simply rub a generous amount onto your skin and use your regular razor to shave. When you’re done, you’ll find that your legs are smooth and clean – and you won’t even need to moisturize them. Keep your skin hydrated and youthful. Simply combine coconut oil with a few drops of your favourite essential oil and whisk it until it takes on a light, frothy texture. Store in an airtight container. Place beeswax, butter, and oils in a small glass bowl and gently heat in a pan of hot water until melted, then add essential oils and Vitamin E Oil. Immediately pour the mixture into lip balm containers. You can purchase lip balm tubes and jars, or you can reuse glass or plastic containers. Allow to cool completely before placing caps onto the lip balm containers. Makes approximately 1.5 oz of lip balm, enough to fill 10 lip balm tubes, or 3 1/2 oz tins or plastic jars. Conventional deodorants and antiperspirants contain aluminium, which has been linked to cancer. 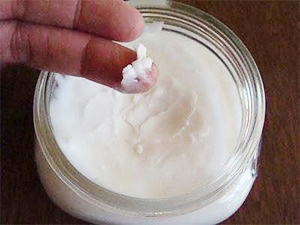 Luckily, homemade deodorant is quick and easy to whip up! Mix together 2 parts baking soda and 2 parts cornstarch with one part coconut oil. The coconut oil moisturizes, the baking soda prevents odours, and the cornstarch keeps you dry. You can add a few drops of your favourite essential oil for fragrance. Next time we see you, you'll be looking for beautiful than ever, and without the guilt of animal testing, corporate influence or chemical manipulation. If you can't pronounce it, don't buy it ! why would you put it ON your body ?